and the longest night for us in the northern hemisphere. It’s a very dark and rainy day here in Vancouver starting strangely at an unseasonal high of 10C (50 F) and to drop down to 5C (41F) this afternoon. But we are to have sunny days and frosty nights ahead. If I can’t have a white Christmas, a sunny, crisp and green Christmas is second best. The light of sunshine or the brightness of snow, the seasonal lights, candles and fires are all a blessing against the darkness of this time of year and the looking forward to lengthening days, in a continuing ancient and universal celebration. 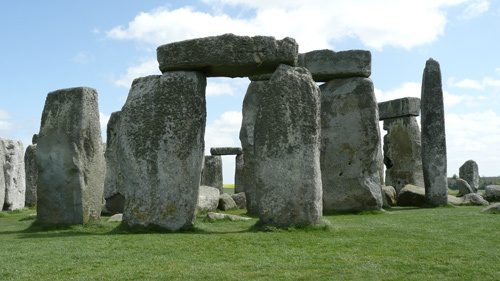 I always think of solstice celebration sites like Stonehenge so this year I’m tickled to be able to put here one of my own Stonehenge photos from our springtime visit there, though the light of course is not as it is this time of year. Also curiously suitable to this day is Qarttsiluni’s publishing of my piece, Silent Messengers: Writing on Stone III. Was it planned so by the editors? Do listen to the fascinating discussion on the podcast. Happy Solstice, dear readers and friends! Keep warm and safe, those of you in other parts of the globe who are snowed in! And my southern friends, enjoy your summer! Happy Solstice to you too Marja-Leena! Happy Solstice! Loved your piece and the discussion at qarrtsiluni. Leslee, thanks for the nice comment at qarrtsiluni. Happy Solstice, Marja-Leena! Will be mostly without a computer until the beginning of next week, so I hope to be able to listen to your podcast soon. Black Pete, thanks, the same to you and yours! R, have a safe trip and a happy Christmas time with your loved ones! Thanks for your ever-faithful visits and comments. Joe, your words are much appreciated!